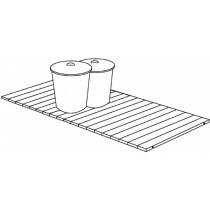 Trash Can Mats with No Spacing are suggested over grass & dirt. There are no spaces for the grass & weeds to grow through. You can also lay a bed of gravel (or similar material) & landscape fabric under your mat to stop grass & weeds.